You would think the season for scarves would be winter, but no... I mean spring! I'm talking beautiful designer scarves. 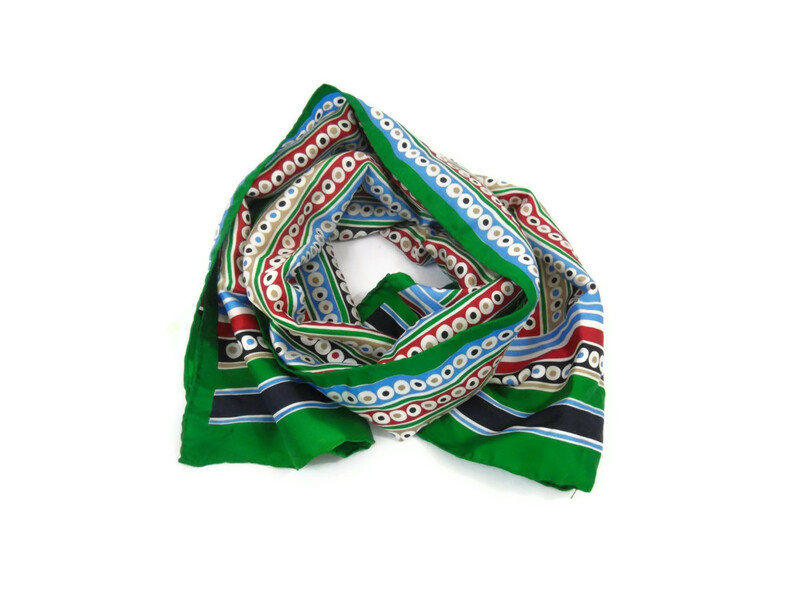 Colorful scarves from Vera Neumann, Givenchy, Echo... Bold colors of the 70s, pretty prints of the 50s, and everything in between. There are a few key names to look for when it comes to vintage scarves. Here I'll outline them for you and tell you what traits they are famous for so you can make the best decisions when deciding which scarves to add to your wardrobe and which designers to search for. First, though, let's start with the basics of materials and construction to look for. Most designer scarves, and especially high-end designer scarves, are made from Silk (caring for silk), though occasionally they could be made from Rayon (a synthetic silk substitute). Many scarves are also made from Polyester, which became popular in the 60s and 70s and holds its color well. Polyester can be machine washed and is easy to care for, so it's a great option for scarf newbies. Then there is Rayon, Cotton and Nylon. Those are the most common materials for vintage scarves. You'll want to look at the hem of the scarf. If it looks like a round tube, with some stitching, this is called a hand-rolled scarf and it was rolled and stitched by hand. 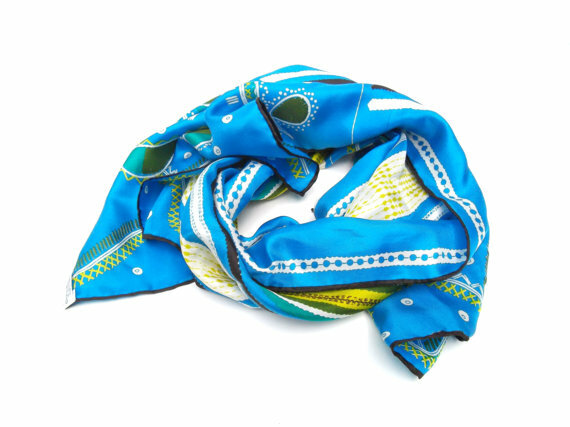 Designer scarves and most silk scarves are hand-rolled, so this is a key factor to look for. Polyester and Nylon scarves often have stitched edges, and some scarves will have woven, un-stitched or fringed edges. Now that you know some basics about what to look for, let's talk about a few designers. First, there's the high-end designers like Givenchy, Hermes, Chanel, Dior, Gucci and Pucci. Of those, I'd say Givenchy and Dior are often the most affordable. Vintage Chanel and Hermes will always claim very high price tags. Most likely in the range of $150 to $400. Naturally, when you're forking out that much money for a pretty piece of silk, it's very important to do your research beforehand. However, I'm no designer scarf expert so we'll move on to some of the mid-range scarves. Hubert de Givenchy is well known for feminine, modern designs that flattered the lady, but over time House of Givenchy has encompassed many looks. My favorites from Givenchy include his more mod and nautical themed scarves. 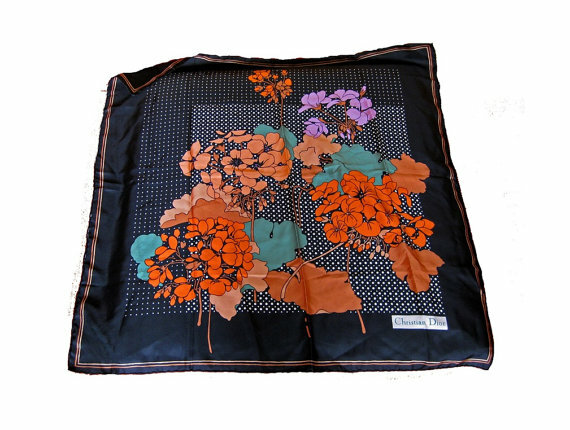 Here is a lovely Givenchy scarf found by a friend of mine and sold on Etsy. Emilio Pucci is well known for geometric prints in a veritable kaleidoscope of color. The colors go beautifully together, and the designs look like little works of art. After the higher end designers, you have some of my favorites: Vera Neumann, Echo, Liz Claiborne, Diane von Furstenberg, and Oscar de la Renta. Scarves in this range are extremely affordable - anywhere from $10 to $35 or $40. You could easily pay $16 for a scarf in Target, so why not invest in a beautiful silk scarf instead? Silk is surprisingly warm, and lasts a lifetime if it's well cared for. A sound investment, if you ask me! 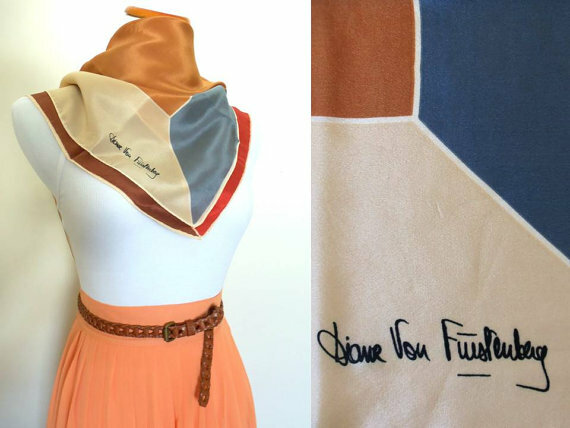 Vera Neumann is quite possibly the most prolific of the above mentioned designers, having made thousands and thousands of various scarf prints. The scarves are always signed "Vera" in cursive and the older scarves (40s to 60s) are accompanied by a ladybug with the Vera graphic. Vera scarves come in all kinds of shapes and sizes, are usually made of silk or silk chiffon, and come in a huge assortment of graphics. Some of the most popular and distinctive are beautiful mod floral designs from the 60s and 70s, but her scarves span such a wide area of design that I feel you can find one to go with almost any outfit. 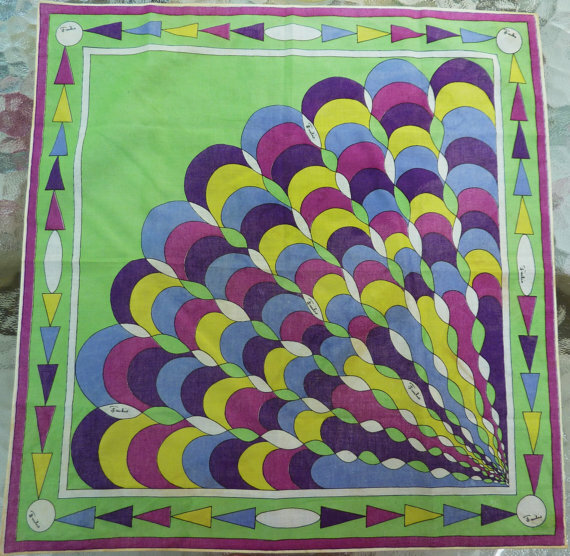 Liz Claiborne is also a very prolific designer, though her scarves are a little less prolific. Her scarves are often from the 1980s, as the Liz Claiborne line was not founded until 1976. Some of my favorites from Liz are the huge florals and bold colors. They make a statement and can be paired with jeans and a simple white shirt for a huge pop of color. Her scarves are usually made from silk or cotton. Available from hanniandmax on Etsy. 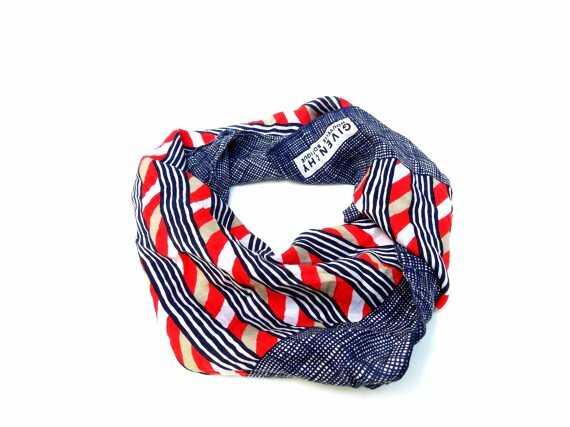 After this middle-range of designers, there's the hundreds of various scarf makers that may or may not have well-known designers behind them. These are prolific, often made of rayon, nylon, or polyester, and are typically very affordable, in the $5 to $25 range. So, have I left out any of your favorite designers? Let me know! I think one of my favourite designers is Jacqmar - I sold a Jacqmar scarf in my shop a little while ago and now I'm on the hunt for more! Their early scarves in particular have such unusual, bold designs. I love the floral scarf you have in your shop at the moment! The print is really pretty. I really enjoyed this post, thanks!